We’ve all been in a situation where we find ourselves with an assistant driver… often without even requesting one. It may be a prerequisite for racers, but when you’re on the normal road, do you really need one? Passengers can be great company during long drives, ideal for traffic jam conversations and (especially so) can act as DJ during long road trips. However, there are those instances when having a passenger can get annoying – especially when they consider themselves driving gurus. As a driver, it is important to keep your focus on the road – that’s why it is important to consider the impact of the passengers you have in your car and for your passengers to consider their impact on your driving from the things they get up to on your journey. The “Fiddler”: As if there aren’t enough distractions on the road already…This passenger simply cannot keep their hands to themselves and their feet off the dashboard. If they are not controlling the music without consent, then they are fiddling with the aircon. The “Backseat Driver”: Not necessarily restrained to the backseat, these passengers can also be found in the passenger seat. Unable to keep their thoughts to themselves because they know everything there is to know about driving, you are bound to get a reaction before an action from the backseat driver. There is always a comment waiting to be shared about your driving; what you should be doing or could have done. The “assistant driver” that would probably kick you out of your own car and take the wheel because they “know better”. The “Sleeper”: Yep, you just became the unpaid chauffeur. Perhaps it’s trust, perhaps it’s fear – but the sleeper has no issue passing out within minutes of hitting the road… leaving the driver to be their own hype man through the journey. The danger is that many drivers complain about the deep sleep that these passengers go into as being contagious. 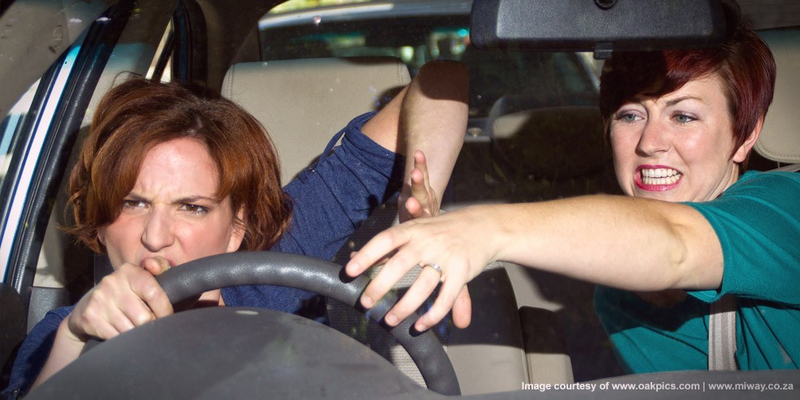 The “Road Rager”: More embarrassing than making a mistake on the road that attracts attention, is a passenger who rages on behalf of the driver. We’ve all had one of these in our car. “Road Ragers” aren’t afraid to let other motorists know of their fiery temper and how they feel about their driving by waving rude gestures or rolling down the window to scream at them. The “Singing Sensation”: Having a karaoke session in the car can be fun, but not if it’s one-sided. Don’t be that passenger who is always singing above the music or only playing songs that only you can sing along to. Sometimes listening to the actual song is what’s preferred. And while you’re at it, watch the dancing – the driver doesn’t need the distraction of having to duck and dive your dance moves. The “Litter Bug”: It’s one thing to eat and drink in the car if there’s general consensus, but it’s another thing to leave the trash in someone’s car when you get out of the car. Cars are a mode of transport, not a mobile bin for passengers! So next time you “shotgun” be sure to check yourself and make sure you won’t be that guy; and if you are the driver, remember that you can turn down the “shotgun” for a more encouraging assistant driver. We may not be able to protect your car from these types of passengers, but we can help you insure it in case the distractions lead to unfortunate circumstances. Get #insurancefreedom today and get an online car insurance quote right now!